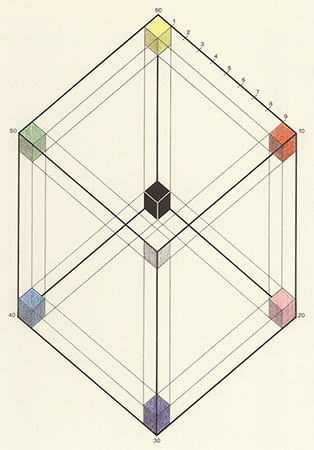 Alfred Hickethier proposed his cube-based system of colours in 1952, a year after the appearance of Aemilius Müller’s three-colour cube. 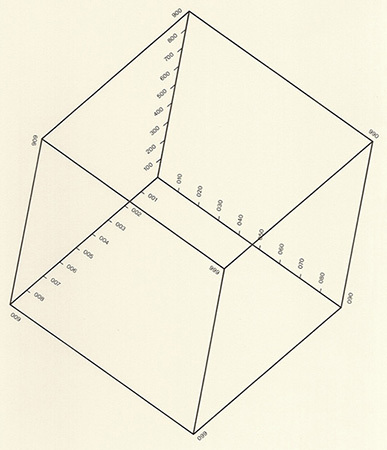 The Hickethier cube was constructed on the same principle, having primarily been developed for practical applications in three-colour printing and three-layer colour photography. Great care was taken in selecting three printing inks for the creation of the primary colours: yellow (900), magenta red (090) and cyan blue (009). These are positioned as primary colours in three corners of the cube. The remaining five corners are occupied by the secondary colours: red (990), violet blue (099) and green (909), as well as the two extremes: black (999) and white (000). The series of achromatic colours runs diagonally through the colour-solid. Together with the three secondary corner points, the three primary corner points form two opposing equilateral triangles. Viewed obliquely from above, the cube reveals an arrangement which corresponds to a colour-circle with six colours. The three primary colours have been selected for their high degree of saturation and are perceived as lying approximately equidistant from each other. By inserting the divisions of a grid, Hickethier produces a ten-part colour series from each basic colour. Each series runs from its basic colour through to the white of printing paper via a series of gradations which are perceived as being almost equal. With white identified as 000, the three basic colours run very systematically: via 100, 200 through to yellow (900); via 010 and 020 to magenta red (090); and finally via 001, 002 to cyan-blue (009). Through superimposed printing of the colours, 10 x 10 x 10 = 1000 standard colours will be created from these basic series. Identification of colour mixtures is achieved by integrating the three-digit numbers of their component parts: if, for example, the colours 700, 030 and 004 from the yellow, magenta-red and cyan-blue series are printed, a mixed colour with the three-digit number 734 will be formed, while the printing of three colours from the same gradation — 300, 030 and 003, for example — will result in a near-grey. The first Hickethier Colour System was printed in 1952 using the dot matrix system. 20 years later, an improved edition appeared, produced by superimposing three colour-layers. In spite of the apparent clarity of the formulation aids which they incorporate, these systems are of little practical use when alternative colouring materials to the stipulated pigments and dyes are employed. Date: The colour-cube was published in 1952. Bibliography: Hickethier, «Farbenordnung Hickethier», Hannover 1952; G. Wyszecki, «Farbsysteme», Göttingen 1960; S. Rösch, «Die große Farbenordnung Hickethier», Ravensburg 1972.